Choosing the perfect dinghy was a subject discussed at length during my recent visit to PDQ. They strongly recommend that total weight on the davits not exceed 200 pounds -- ideally, not over 100 lbs on each davit. Also, the clearance between the hulls (and davit legs) is just a bit over 9 feet. These constraints limit the choice of suitable dinghies for the 34 Powercat. In choppy waters (such as the Bahamas) you want the biggest, driest dinghy possible. With little reason to fold or stow the dinghy, the RIB style boat with its solid, V-bottom hull makes the most sense -- to me anyway. An alternative is a completely solid hull which does have merit, but unfortunately most of these are too heavy in the appropriate size. I included the Boss Boat and Livingston for comparison, but as solid-hull models, they are heavy for their size. With weight such an important factor here, there are better choices - IMHO. Other popular models not included above are the Zodiak (PVC instead of Hypalon fabric), Walker Bay classic models (heavy, limited capacity), Bullfrog (heavy, expensive) and many of the heavier models from the manufactures listed above. Sandy Kramer of m/v 34 Mishigas (Hull No 68) uses an AB Ventus 9 VL with a 15-hp, 2-stroke OB says he's very happy with that combo. Because of the 9' - 6" length, he's learned to lower one end first in order to clear the hulls, but he says it's a minimum inconvenience in exchange for a large, comforable, relatively dry - and fast - dinghy. More recently (Feb 06) I heard from Jim Stalnaker of m/v 34 Elixer (Hull No 63) who's using an Apex Lite 10 with a 15-hp Honda 4-stroke OB. He believes strongly in the merits of a larger dinghy and, like Sandy, has found a way to make it work without too much hassle. Not having had recent experience with any of the above-listed dinghies, my conclusions are based on the data that I've collected. 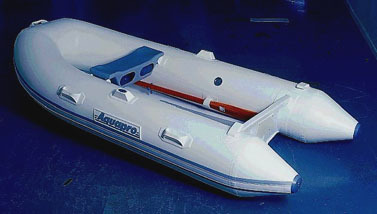 The light-weight winner was the Aquapro SMR 901. (An even lighter version, the SLR 901, is also available for the serious weight fanatic). 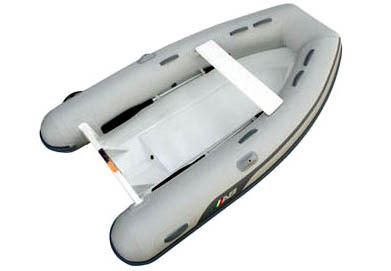 These dinghies fit comfortably within the hulls, are recommended by PDQ, and are conveniently availble at Port Whitby Marine Supplies should you wish to take delivery along with your new boat. Finally, if you really want to push to the max, you could go with Apex 10 Lite, or perhaps my most recent discovery, the Walker Bay Genesis 310 FTLH. This boat is unique among the light-weights in that it has a double floor - so your feet don't get wet whenever there's a quart of water in the boat. I'd certainly welcome comments or suggestions on this topic. Perhaps there are other owners out there with other and/or bettter solutions? If so, please let me know - so I can share your thoughts. 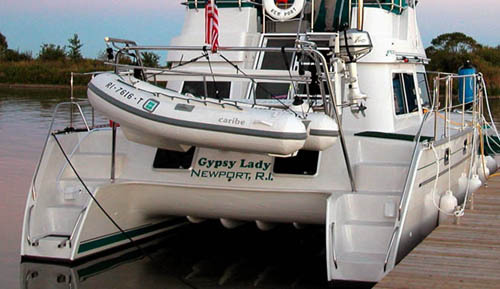 Carefree Cruising & Pristine Ports... from a guy who's a bit dinghy himself !! !